I love the section on Satan and Job, in the new book about the Father and the Son! When people find out that Satan is not who they have always thought he was, they are going to be very surprised. And they will find out who God really is, too! You are right, Satan was evil, but he was still carrying out God’s orders! That is very clear. I can’t wait for God’s people to read this book and finally see that Christianity has done a number on them – and on us, too, until God showed us the truth. 🙂 This is good! Thank you for writing. This is an important issue and you should ask about it until you are rooted in the truth and are certain of what is right. There have always been false teachers who confuse God’s people concerning God’s requirement of holiness. In Jeremiah 3:7-10, the false teachers taught that Jerusalem would never be destroyed because God’s temple was there. But God was telling them they would be safe only if they “amend your ways”. And in Malachi 2:17, the false teachers were ridiculing the notion that there is any judgment for disobedient children of God to fear. In this covenant, false teachers are still at work, using the word “grace” and the name “Jesus” to persuaded people that how they live will not determine where they spend eternity. This is a deadly doctrine, as the two gospel tracts below will explain. Please let me know what you think of them and how it goes with your group. PS It sounds as if your group might be a mixture of people with the baptism of the Spirit and people without it. There is no hope whatsoever of unity in the light of Christ if that is the case. You all must be filled with the Spirit if you hope to walk together in the light. It would be better to gather with 2 or 3 humble souls who have God’s Spirit within them than with 2 or 3 hundred without it, or half of them filled. Thank you for your response to me. I wrote because of the ones in our Sunday school class that is of the false Christian up-bringing. I was invited to go to this class as i was walking one day and the girl said she thought the Sunday school teacher had the Holy Ghost like I was witnessing to her. Later on after i began to go , the girl also did receive the Holy Ghost. the other four do not have and they all have that Baptist teaching that saved is filled with “the spirit” and that “baptism of the spirit” is different and is an extra special gift that one doesn’t have to have but is nice ….Its enough to make one sick, yet I persevere to try to help them to see. Should I just abandon them and go to someplace that is all “filled”. I’ve had the Holy Ghost 42 years and i do agree with your tracts. I printed and handed them out but they are so stubborn !! Please pray that God will open the eyes of their heart. I also wanted to show your response to the class. Where did the little girl receive the holy Ghost? There where she is going? What is the name of that church? And how did you come to understand the truth about the new birth? Also, I don’t know of any place that “is all filled”. It is all a confused mess out there. That is why God is calling for His children to come out of Christianity. God has been very good to us here, giving us an oasis in the midst of a spiritual wasteland. Some of the younger people here have never participated in the confusion that is Christianity; all they have ever known is the truth, and they can only imagine how it is for most of God’s people, such as yourself, struggling constantly with the spirit of antichrist. If you ever find a place where a man is teaching the truth to a congregation who loves it, please let me know. That would be a place worth traveling to see. As to your question, whether to keep being a part of that madness or leave it, the wisest answer I can give you is to echo what your heavenly Father is saying to all His people, “Come out of her!” I suspect that being around it has already affected your heart more than you realize. I wish it was not that way, but I do not want to pretend, as so many children of God are doing, that that to partake of the deluding wine of “the great whore” is the our only alternative. The reality is, death would be better. I pray that you will fall so much in love with the truth Jesus has shown you that you will not let any unclean thing touch it. PS Please read this, concerning the antichrist. What do think of divorce, and all these charismatic leaders who are going thru it, and they remarry? God hates divorce, and it should always be the last option when marital problems arise. As for any particular cases of divorce among charismatic leaders, I know nothing except what I hear through the media. In other words, I really know nothing at all. And, if you will allow me to say so, neither do you. Let’s concentrate on the tasks God has given to us, and pray for those who may be going through dark, hurtful times. I was going through some things getting ready for my move and I ran across some notes from your “Fundamentals of the New Testament” class in 2008. They felt so good to me that I thought I would share them. These thoughts help me to remember who I am (who we are) and I love them! 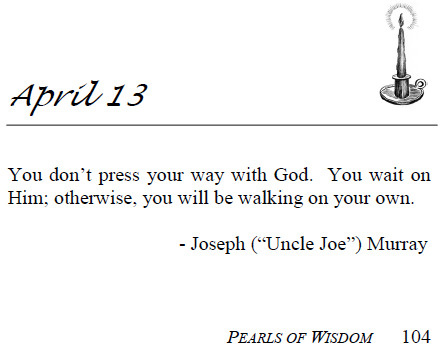 The point of this “Pearl of Wisdom, below, is that God cannot be manipulated. One afternoon, about 20 years ago, I warned a sister in the Lord that if she did not stop trying to manipulate God into doing things her way, she was going to drive herself insane. That same night, long after bedtime, I received a phone call from her distraught daughter. In the background, I could hear the voice of that sister I had warned. She was walking about the house, screaming, for a long time. I couldn’t make out her words, but her daughter said she was screaming obscenities and other things as she walked around, but then she would stop doing that and speak in tongues. Her husband didn’t know what to do. This went on for a good while that night, and there was nothing I could do about it. She had driven herself mad trying to pressure God ito doing things her way. This “Pearl” contains an important bit of wisdom. It means, in case any among us is unclear about it, that we are not God. And that means that we had better learn how to humble ourselves to His way, or we will certainly face some unsavory consequences. The things you have written on “Principalities and powers” made me think, and I wonder if the spirit( ruling this country is the same one as say, back in the 40’s or 50’s, or is the US under a more evil one, especially with what we’re seeing with the government today. Yes, think a new demon is in town, controlling this country. Exactly how that works, I don’t know. But inasmuch as Satan has power over the angels that rule the nations, he can re-assign them at will. He even said so to Jesus during the Temptation. Also, I have a question concerning “Principalities and Powers”. At the end of the first lesson, you state that Satan was ruler over the wicked powers in the world, and that’s the position that he offered Jesus. So, obviously Satan wouldn’t have known that they were “evil”, right? If he did, he or other angels would have seen something about it, I would suspect. So would he have been blinded to the fact that they were evil and just taken over by the fact that he was “ruler”? Since the Son was not yet revealed, nobody could have known what God was really seeing as “evil”, so Satan would not have seen those angels as evil. No. This is so very good. I love how you dissected Satan and showed how wrong he was about Jesus. Who knows these things?! God is feeding us manna from heaven with the wisdom we are getting in the writing of the Father and Son. I want to cherish every word and love it as He does. It shows us even more how much God loves His Son. The contrast that you bring out about the “Light-bringer” and the light (holy Spirit) which the Son brought, and also what Satan thought and what his ministers portray was so good. Who knows these things?! Well, needless to say, I was blessed reading this. We are so loved and cared for by our Savior. Sometimes I don’t even know how to respond to such sweet riches. I suppose the best way is to love it and live it, and stay thankful to be a child of God in the truth.